No; like him very much as is. My custom vegeta heads from David F. are done and shipping out. Cannot wait to display all forms! If I could confirm that these aren't going to cost me a fortune, I'd actually like to have these on my Vegeta, that and if the head didn't snap off. Yours too huh? Did it fall? I ended up buying another one. Seems they aren't strong neck pegs if they take too hard of a tumble and land on their head. Nope. I went to pose him then his head snapped. He's back in his box now. I fixed mine. A little gorilla super glue and some tamiya thin cement and it’s good as new. Granted the neck swivel won’t work now but it never really helped in my posing anyway and his head still turns and looks up and down. Ah, cool. I wonder if this could fix my base Goku neck because I dropped him on his head back in 2015. Don’t see why not. What I did was use gorilla glue initially to get it back in place, then afterward used the thin cement around it to strengthen the bond when the gorilla glue dried some. Let it sit for a couple hours then out he head on nice and easy and voila. Of course you can heat the head up some to make it easier to pop back on. better than the demoniacal fit versions. I don't even think there's a comparison, lol. true...it would be nice though if he did the god red and the god blue on the slimmer vegeta (SSJ 1.0). These are mine and ones that I had commissioned. I feel that the 1.0 bodies are crap and that's why I had them made for these. 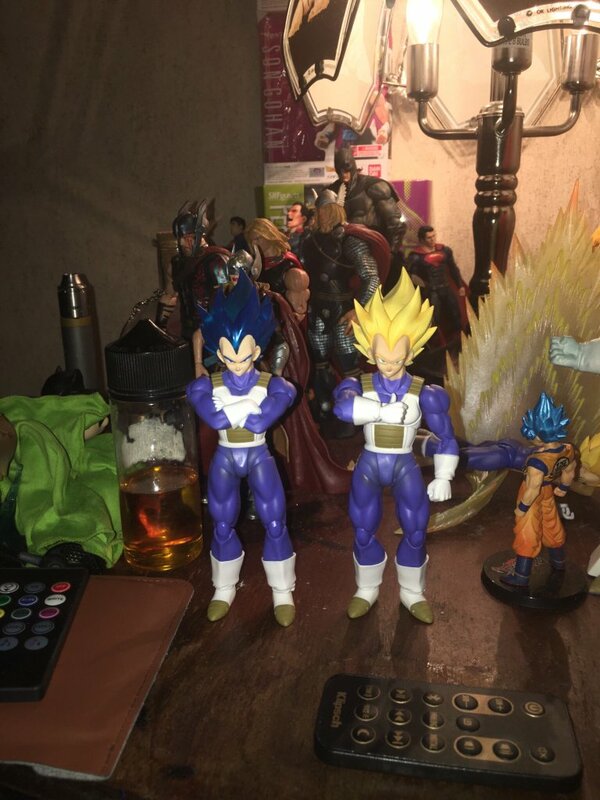 I am more than happy with how they came out and which Vegeta I chose them for.